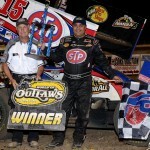 KNOXVILLE, Iowa (Aug. 11) Donny Schatz has a knack for being at his best during Sprint car racing’s biggest week. 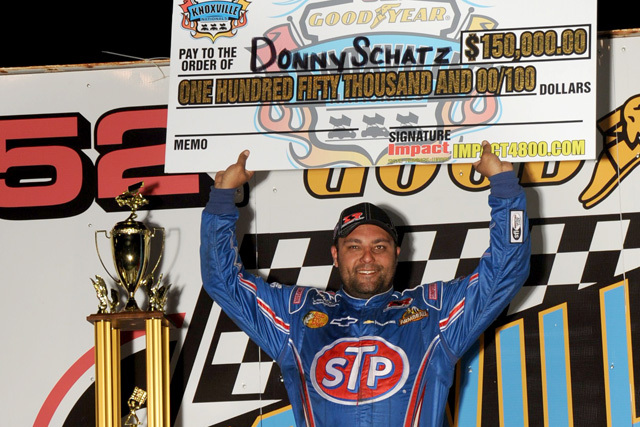 The trend continued with this year’s 52nd running of the Knoxville Nationals as Schatz raced the Tony Stewart Racing (TSR) No. 15 STP/Armor All/Chevrolet J&J to victory in Friday night’s final race, the National Speedsport News World Challenge, and Saturday’s 50-lap A-Main. His week began with a solid qualifying night positioned him fifth on Saturday’s grid. The Fargo, N.D., resident jumped into third when the green flag dropped. He worked on Jonathan Allard for sevens before grabbing position two with a low move through turns one and two. For the next five laps, he tracked early-leader Stevie Smith and used the extreme bottom coming out of turn four to seize the lead on lap 14. Schatz paced the field during the next dozen laps before the competition caution was waived and each car came in for a five-minute pit stop. The STP 15 took off again when the race resumed while Craig Dollansky and Brian Brown battled for second. 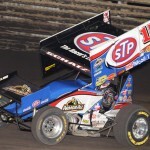 Brown would ultimately get the spot and begin closing the gap on Schatz. As the laps clicked off, it looked as if Brown was narrowing the gap. When he jumped the cushion in turn two with less than 10 laps remaining, it allowed to Schatz keep the margin comfortable. Brown did make one final effort coming out of four, but he came up just short. Big indeed, as Schatz becomes only the second driver to have six Knoxville Nationals A-Main winner trophies. He moved one ahead of his childhood hero Doug Wolfgang in Nationals history by leading 34 laps and increase his career total to 167 laps lead in the Nationals, which ranks second to Kinser.